If Yahoo decides to put itself up for sale this week, it will mark yet another turning point for a company chock-full of them. Yahoo started out in 1994 as "Jerry and David's Guide to the World Wide Web," a list of websites organized by category put together by Stanford graduate school students Jerry Yang and David Filo. 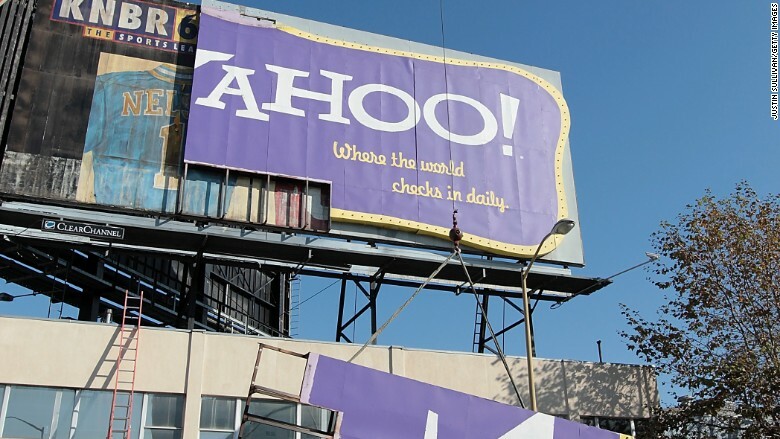 Yang and Filo quickly changed the site's name to "Yahoo" (in nerd fashion, they joked that Yahoo stood for "Yet Another Hierarchical Officious Oracle"). Yahoo officially incorporated on March 2, 1995. Yahoo has evolved and morphed several times since its inception. 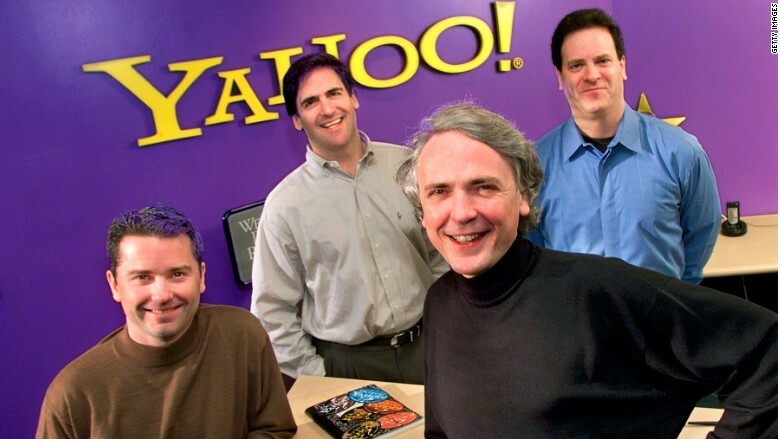 Yahoo bought Broadcast.com in April 1999, making entrepreneur Mark Cuban (second from the left) his first billion. Before the dot-com bust, (and before Google started eating its lunch) Yahoo grew to become an Internet titan. The site rapidly became one of the Web's go-to search engines and Web portals. In the 1990s, Yahoo was in many ways like Google is today: the starting point for many people when they browse the Web. Yahoo (YHOO) bought up dozens of companies in its early expansion, with a very hit-or-miss track record. One of Yahoo's most successful purchases was a company called Four11. Yahoo bought the webmail service for $92 million in March 1997, and it eventually became the foundation for Yahoo Mail -- now the third-largest mail service, behind Google's Gmail and Microsoft's Outlook. In January 1999, Yahoo bought GeoCities, a Web hosting service that gave many Internet users their first websites. GeoCities was the third-most visited site on the Web behind AOL and Yahoo in 1998, but it was quickly overshadowed by social media sites like MySpace and ultimately Facebook. The company also bought Mark Cuban's Broadcast.com for $5.7 billion in April 1999. The service, which simulcast TV and radio programming on the Internet, was way ahead of its time. Yahoo eventually broke up Broadcast.com into various streaming media businesses, none of which exist today. Unlike many of its rivals, Yahoo survived the dot-com bubble -- though it did not emerge unscathed. The stock fell from an adjusted all-time high of $118.75 on January 3, 2000 to $4.06 on September 26, 2001. As Google (GOOGL) began to gather steam, Yahoo's search dominance started to erode. Yahoo lost out to Google as AOL's default search engine in 2002, and it was pretty much all downhill from there. But there were a few big wins for Yahoo in the post-bubble, post-Google days. Yahoo bought a tiny company called Ludicorp for $25 million in 2005. 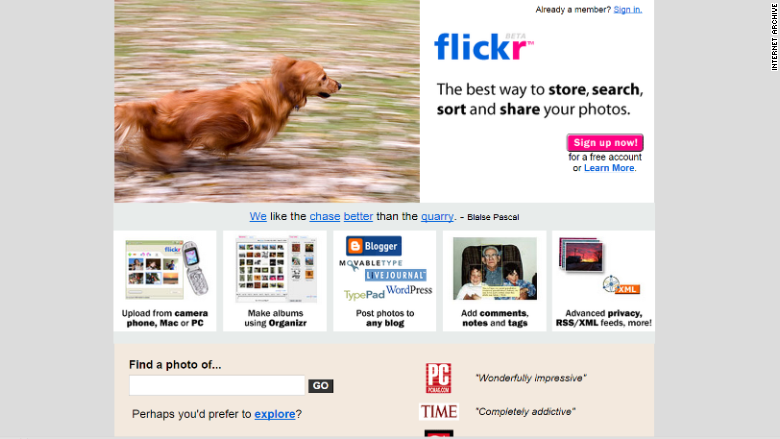 Ludicorp operated a tiny photo-sharing site called Flickr, which has emerged as one of the largest photography sites on the Internet. That year, Yahoo also made one of its most prescient -- or luckiest -- acquisitions, paying $1 billion for a 40% stake in Alibaba -- now worth $30 billion. But its most massive mistake might have been rejecting Microsoft's (MSFT) $46 billion takeover bid in 2008. That's $15 billion more than Yahoo is worth today. "Sometimes, you're lucky," former Microsoft CEO Steve Ballmer said about the failed takeover bid in 2011. As Yahoo struggled to grow, the company went through a revolving door of CEOs. Founder and "Chief Yahoo" Jerry Yang briefly took over the reins, until giving up the job to Autodesk CEO Carol Bartz in 2009. After unceremoniously firing Bartz (by phone) in 2011, Yahoo hired former PayPal president Scott Thompson in January 2012. Thompson intriguingly wanted to transform Yahoo into a media company but lasted just four months on the job. He was quickly fired after a résumé scandal erupted. But Thompson hung around just long enough to lay off 14% of Yahoo's staff, eliminating about 2,000 jobs. 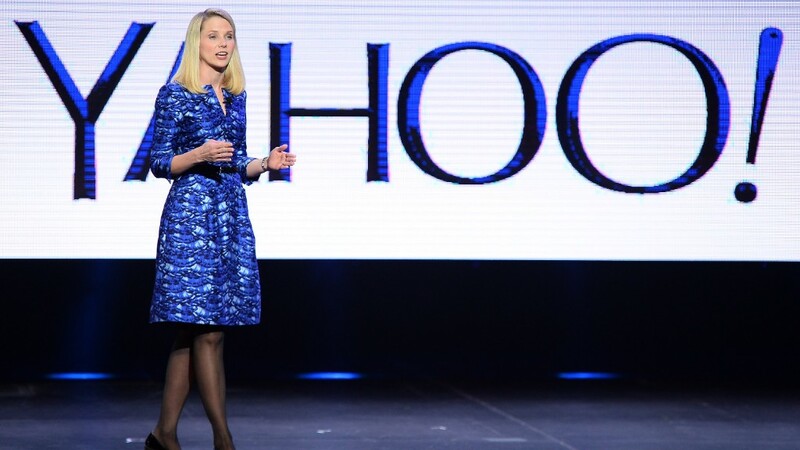 Then, in a big splash, Yahoo hired Google executive Marissa Mayer in 2012. Mayer instantly tried to transform the company's culture. Mayer also put a big emphasis on improving Yahoo's user experience, changing the logo and hiring big media talent like Katie Couric. She also orchestrated the $1.1 billion Tumblr purchase in 2013. But Yahoo has failed to grow under Mayer. Yahoo ceded its most-visted website title to Google in 2011 (though it briefly took that back in August 2013). Once the largest online advertising network in the world, it has lost ground to Google and Facebook -- and the gap continues to widen. This week, Yahoo's board is considering a sale of its core Internet business, according to the Wall Street Journal.